G12 Lights are the perfect set of lights to accent any area without feeling and looking like a traditional set of Christmas Lights. Each lamp is 12mm in diameter and have a globe shape that is textured to help distribute the light better. 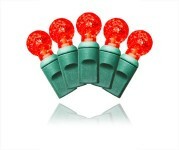 This set of G12 lights has 35 red LED lights. 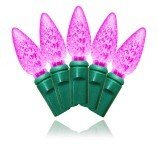 The lighted length is 11.6' long with 4" between each light and 4" lead cords. 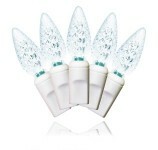 Using substantially less power than the traditional incandescent set, connect up to 210 watts. UL listed for indoor and outdoor use. Each set is rated at 2.6 watts.